Even though I love almost all things Disney, I will admit that I never understood the appeal of Tsum Tsum’s. I didn’t understand the need to transform beloved characters into the odd flattened oval shapes and what people did with the toys beyond collect them to display on a shelf. This weekend I baked up cakes and cupcakes in celebration of two very special little boys – my own nephew and my friend’s brand new nephew. They didn’t turn out exactly as I had wanted, but I had fun doing it and being able to make their celebrations a little sweeter. For my nephew, we were celebrating his third birthday! My sister bravely hosted a house full of young kids so I decided to help out by baking and bringing the cake. I know most kids are overloaded by stuff these days so my hope is that the gift of my time and talent to make his birthday cake is more valuable then just another toy. Max is into cars and planes and all things that move. 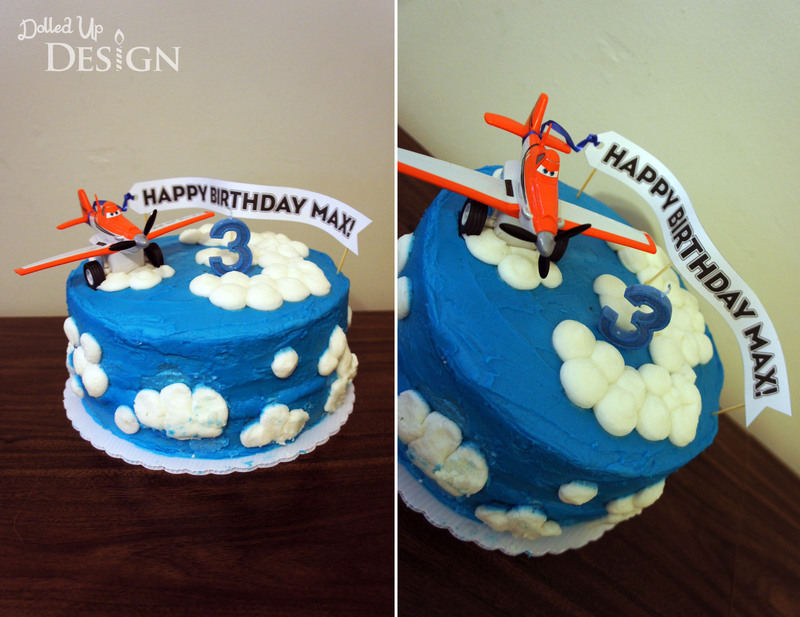 Last year I made him this construction themed cake so this year I decided to go with the Planes theme and did up this simple blue cake with white clouds and a Dusty toy as the topper. 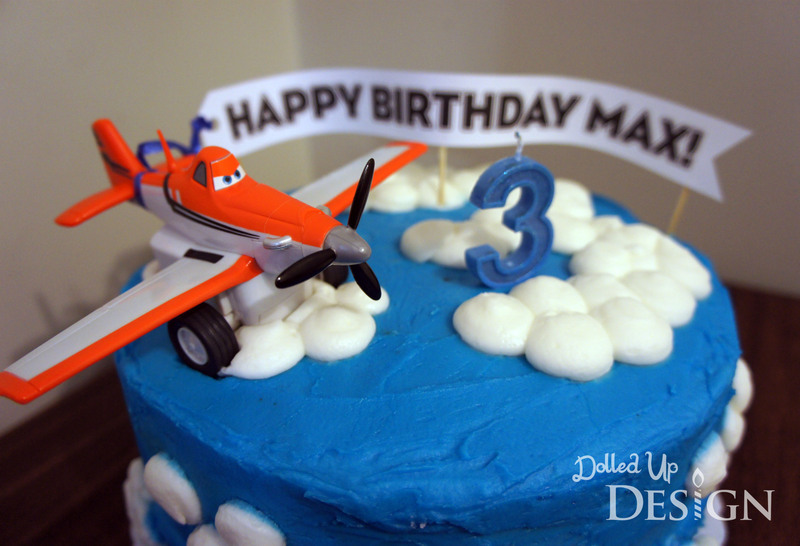 The cake was finished off with an inexpensive paper banner flying behind Dusty and a “3” candle from the Dollar Store. My fluffy white clouds along the sides ended up sliding in transit, but it was easily fixed and overall I was happy with the finished cake. Max couldn’t wait to get into it and my husband had two slices, so I must have done something right! For flavours, I kept things simple and both cakes were chocolate cake filled with a delicious banana creamcheese filling. As you will see below, my second cake had a monkey theme so the banana seemed fitting. I also added some Skor bit’s into my nephews cake for good measure and they added a nice little bit of crunch. 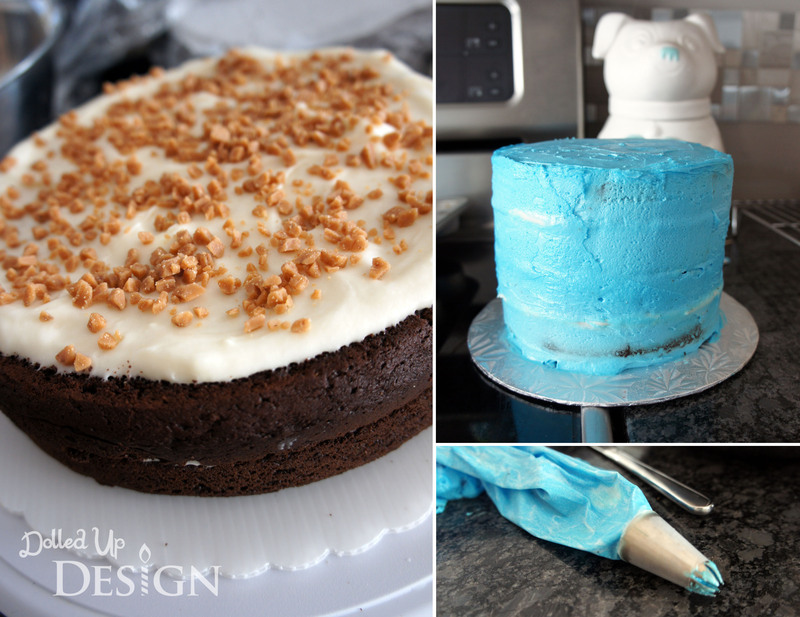 Lucky for me the 2 cakes being for boys also meant I was able to use the same blue icing and save some time (and dirty dishes!) when mixing up buttercream. The second cake was for a baby shower in celebration of my friend’s new nephew. When she asked me to make her a cake, I was a bit hesitant because I still don’t feel that my cake making skills are good enough for anyone to actually pay for. I had done a ruffle cake for my daughter’s birthday cake in May and it turned out pretty well so I suggested that style since I was fairly confident I could pull it off. I asked my friend to snap some photo’s of the finished cake, but unfortunately she forgot her camera and had a bit of a hectic day so unfortunately my quick, crappy iphone picture of the finished ruffle cake will have to suffice. 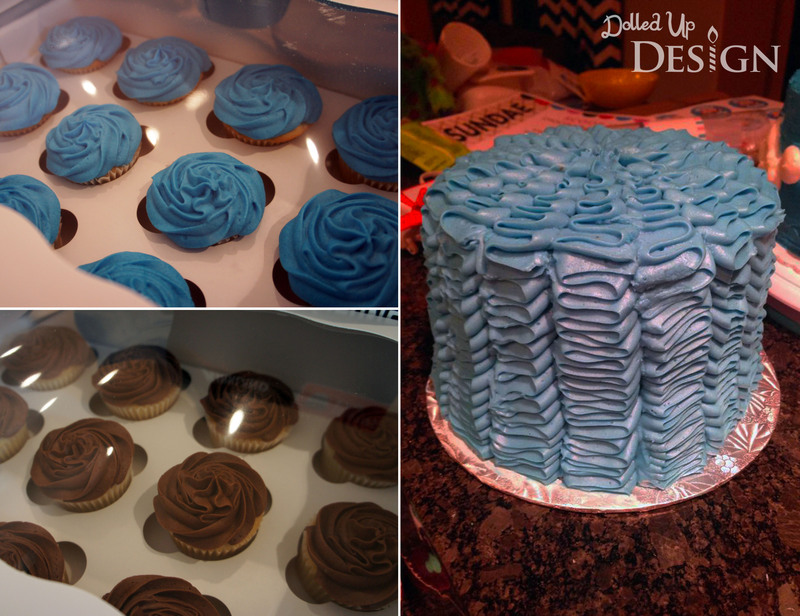 The cake was just a 6″ round, so I also baked up 2 dozen cupcakes to ensure she had enough cake for all her guests at the shower. 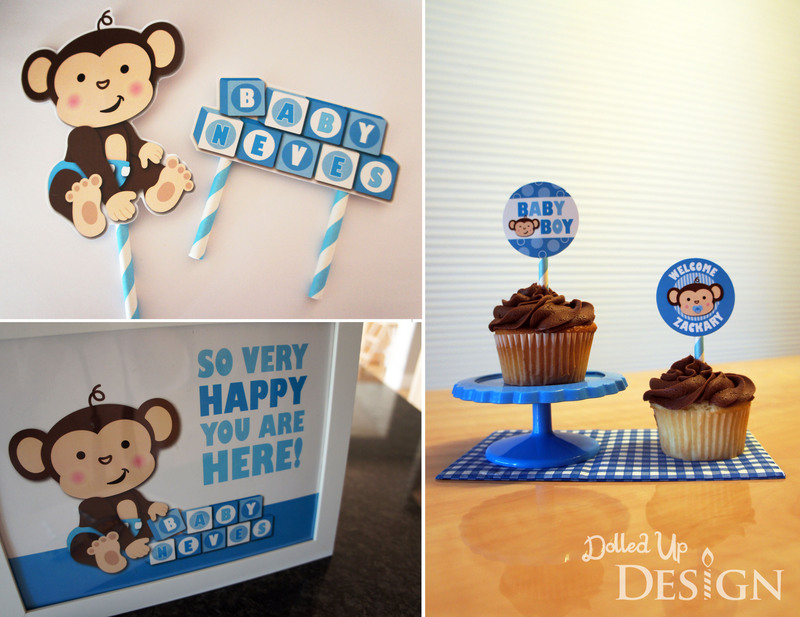 To finish off the cake, I designed a cute paper monkey topper and blocks that spelled out baby’s last name. 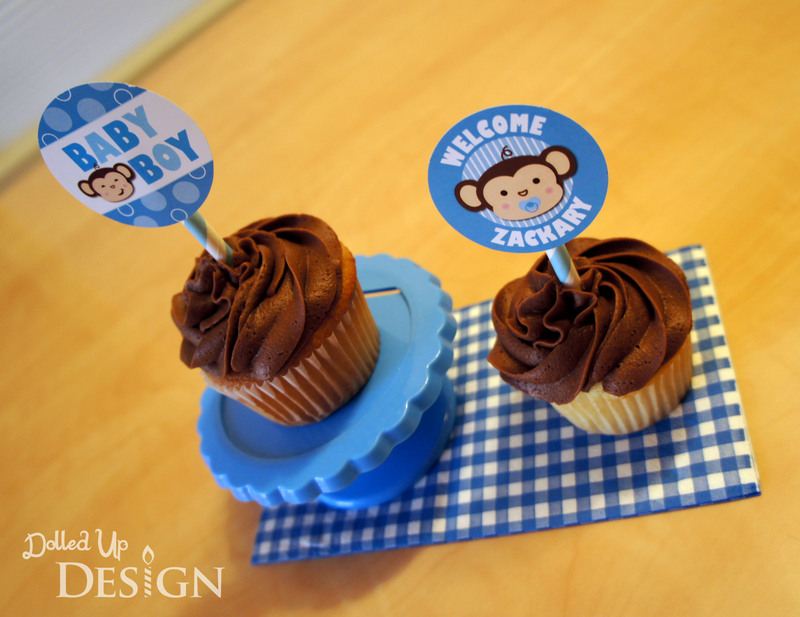 For the cupcakes, I incorporated the same monkey into two different paper toppers that got hot glued to striped paper straws to stick into each. 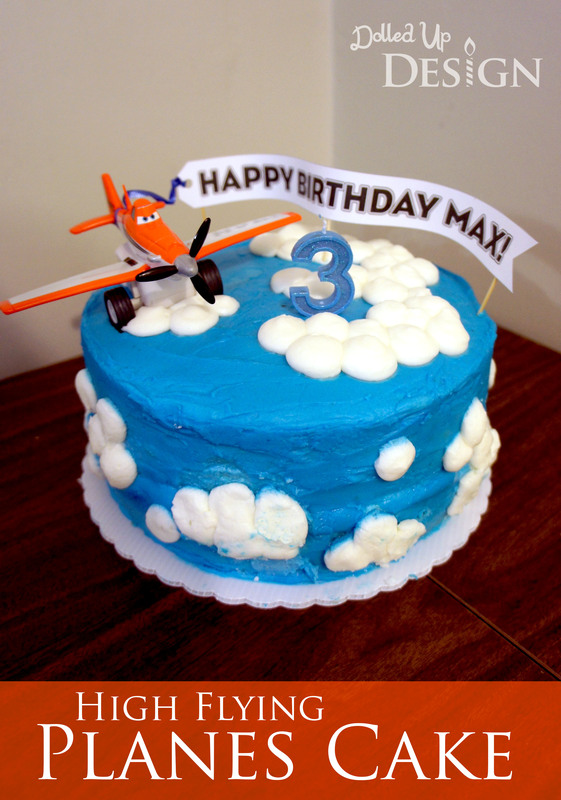 Happy 3rd Birthday Max and Welcome to the World Baby Zackary!